I’ve often said that organizing is a journey. And it is…but it’s an ongoing journey as opposed to a one-time deal. Sure, from time to time you arrive at Destination Organization—that place where everything has a home and everything is in its designated home. And that feels and looks great. But then, life happens…again. The kids wake up and take out the toys. You pull out your craft supplies to work on an ongoing creative project. You make breakfast, lunch, and dinner, and the dishes pile up…again. You go to the store and get some new stuff—stuff that you have to find a place for once you get back home. Life happens, and in the process, clutter happens, too. But isn’t that the point of getting organized in the first place—to make the way life happens sweeter, and easier? The end goal for getting organized isn’t really to get to Destination Organization and stay there. Instead, the ultimate goal is to get to Destination Organization so you can leave the station and head somewhere else—that place where you live and enjoy your life. If you’ve ever been discouraged by the ongoing nature of getting organized—such as when you’re faced with a pile of toys in the toy room you just decluttered two hours before—then you may find it difficult to embrace the idea that organizing is an ongoing journey instead of a one-time event. How do I stay motivated on this endless journey? you might be wondering. Well, here are some ideas just for you. Shift your perspective. Your home isn’t supposed to look like it can grace the pages of a magazine every single second of the day. Things out and in use means life is happening! This is a good thing. Embrace daily clutter as a sign that you’re living a full, productive and happy life. Tidy up regularly. Instead of feeling defeated by daily clutter—the clutter caused by living your life—decide to tidy up and put things back where they belong on a regular basis. One of my online workshop participants recognized that the daily clutter of her ongoing projects was weighing her down. Her solution was simple: a handled market basket to corral project supplies between work sessions. This simple idea makes it easy for her to tidy up regularly and no longer feel bogged down by project clutter—because there isn’t any, anymore. What simple technique can you employ to make it easier to tidy up regularly? Reevaluate regularly. Reassess your belongings on an ongoing basis. The less stuff you have, the less time you’ll spend dealing with your stuff. Stated differently, if your home is only filled with things you truly love and use, you’ll spend more of your time living and enjoying your life, and less of your time dealing with (and reorganizing!) your belongings. Keep this in mind: every single thing you bring into your home has a cost—even free things have a cost. Stuff costs you time and space. So contemplate what you’ll allow into your home by not only asking if the item is in your financial budget, but also by deciding if you truly have the space and time to deal with this item, both now and on an ongoing basis. Keep your systems simple. When organizing a space, keep simplicity in mind. Make it simple to keep your space organized by storing everything you need to perform an activity together. Then, add labels to your finished organizing projects so you remember what belongs where—and so others can help you put things away, too. Treat yourself to organizing solutions you love. The more you love an organizing solution, the more likely you are to use it (and enjoy yourself in the process). So to remain motivated to keep your spaces tidy, make sure you like how your space looks when it is picked up. 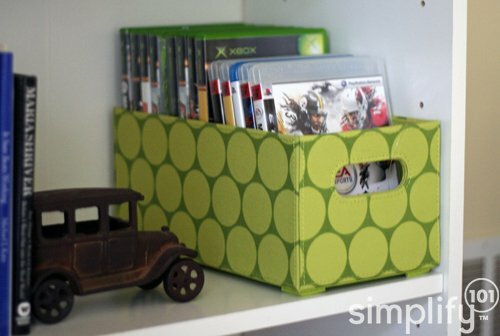 Invest in organizing solutions you love to help maintain the motivation to keep your space organized and clutter-free. Staying ahead of clutter is a battle for a lot of people. Perhaps your info will help someone who hasn’t accessed your website before.